SPINNING WORLD (USA) (Chestnut 1993-Stud 1998). 8 wins-2 at 2, Breeders' Cup Mile, Gr.1. Sire of 897 rnrs, 595 wnrs, 43 SW, inc. Heavenly Glow (STC Arrowfield Stud S., Gr.1), Ancient World, Special Harmony, Spin Around - Better Boy (H.K. ), Thorn Park, Spinning Queen, Arlingtonboulevard, Lyrical Bid, Duff, Echoes in Eternity, Kosi Bay, Super Profit, Spin 'n Grin, Spinola, Coupe, Visionario, Common World, Changing World, Our Quivira, etc. TAXMEIFYOUCAN (g. by Ad Valorem). 2 wins-1 at 2-at 1200m, 1400m, A$541,730, Scone RC Inglis Guineas, RL, ATC Vale Geoff White 2YO H., 2d ATC Sydney Markets Limited H., Goulburn Cup, ATC JB (Barry) Maher Memorial H., Golden Slipper Nominations 2YO H., 3d ATC Royal Sovereign S., Gr.2, Gosford Guineas, L, ATC Inglis 2YO Classic, Vincents Chartered Accountants Filante H., 4th ATC Theo Marks S., Gr.2. Kwaito (f. by Johannesburg). Winner at 1000m in Aust. Homestead. 7 wins-3 at 2-at 1000m, 1200m, A$157,310, VRC Young Members' H., Diamond Shower H., Aurie's Star H., VATC Playbox H., VRC Lauda-Air 2YO H., MVRC Hollymount 2YO H., 2d VRC Headquarters H., VATC Inglis Premier Sales H., VRC Bentleigh Signs 2YO H., 3d VATC Jack Elliott H., MVRC Vobis 2YO H., 4th VATC Blue Diamond Prelude, Gr.3-twice. Producer. ENCORES (Marscay). 4 wins-1 at 2-at 1200m, 1500m, A$531,076, STC Phar Lap S., Gr.2, Winfreux Quality H., Light Quality H., AJC Malta 2YO H., 2d BATC Doomben Ten Thousand H., Gr.1, QTC Stradbroke H., Gr.1, STC George Ryder S., Gr.1, AJC Stan Fox S., Gr.3, 3d AJC Ma Cheri 2YO H., 4th BATC Foster's Cup, Gr.2, AJC Brian Crowley S., L. Sire. RUBIJON (Rubiton). 8 wins from 1400m to 2200m, A$452,425, Ballarat Cup, L, 2d MRC Easter Cup, Gr.3, TRC Hobart Cup, Gr.3, VRC Paris Lane S., L.
SIR LAURENCE (Bletchingly). 3 wins at 1200m, STC Eskimo Prince H., L, AJC Paddock H., STC Kogarah H., 2d AJC Chisholm Welter H. Sire. (HELENE) PILLAGING (Marauding). 9 wins-4 at 2-to 1500m, A$1,078,900, HK$6,528,750, M$1,196,000 in Aust., HK and Macau, VRC Sires' Produce S., Gr.1, AJC Heroic 2YO Championship S., Macau Hong Kong Trophy, HKJC Asakusa H., Hong Kong Macau Trophy H., STC CVD Treasurer's 2YO H., VATC Bint Marscay 2YO P., HKJC Volunteers' Challenge Cup H., Tai Mo Shan H., 2d HKJC National Day Cup, HK-3, AJC William Inglis 2YO Classic S., HKJC HSBC Premier Sha Tin Vase, 3d MRC Blue Diamond S., Gr.1, 4th HKJC Chairman's Trophy, HK-2. SPLENDID HORSE - SPLENDID BO BO (Mac.) (Geiger Counter). 5 wins-3 at 2-to 1300m, A$209,560, M$386,550 in Aust. and Macau, Illawarra 2YO Classic, Gr.3, VATC Vain S., L, ACT RC Black Opal Preview S., L, 2d ACT RC Black Opal S., Gr.2, 4th City Tatt's RC Lightning H., L, VATC JD MacDonald S., L.
DEL TORO (Deputy Governor). 10 wins at 1200m, 1400m, NZ$257,350, CJC Great Easter S., L, Manawatu RC Ashhurst-Pohangina Cup, WRC Zephyr It Can be a Breeze H.-twice, 2d Levin S.H., L.
INDIAN RAJ (Century). 6 wins-2 at 2-from 1200m to 2400m, A$250,920, Newcastle Gold Cup, Gr.2, STC NE Manion Cup, Gr.3, AJC Ron Casey Flying Welter H., NSW Tatt's RC Welter H., STC Radio 2UE H., 2d AJC Spring Champion S., Gr.1, Metropolitan H., Gr.1, 3d AJC Chipping Norton S., Gr.1, STC Tulloch S., Gr.2, Premiere S., Gr.3, Geelong RC Derby Trial S., L. Sire. Miami Vice (Century). Winner. See above. Trading Post (Canvasser). Winner at 1250m in HK, 2d VRC Maribyrnong P., Gr.2, Flemington S., L, 3d MVRC St Albans S., L, VATC Balmoral S., L.
Stage Beau (Lord Seymour). 6 wins-1 at 2-from 1000m to 1600m, A$91,910, AJC Alan Potter H., Rod Smart Real Estate H., 2d STC Audley H., 3d AJC Carbine Club S., L.
Stage Whisper (Rubiton). 5 wins from 1350m to 1800m, A$118,970, AJC North Sydney H., Monte Carlo 3YO H., WATC Bon Rosa H., 3d Kalgoorlie Boulder RC Boulder Cup, L.
CHERRY CREEK (Monashee Mountain). 8 wins-1 at 2-to 1200m, NZ$97,800, CJC Canterbury Belle S., L, Breeders' Trial, CRT Raceday H., Otago RC Paul Ferris Memorial 2YO Trophy. Producer. MONDANO (Spartacus). 6 wins-1 at 2-to 1400m, A$320,985, MVRC Mitchell McKenzie S., L, MRC Moss Rocket H., 2d VRC Moomba P., L, 3d VRC Debonair S., Gr.3. HONEY FLOWER (Bel Esprit). 4 wins to 1200m, A$215,375, VRC GH Mumm S., L, Geelong RC BC3 Thoroughbreds Black Pearl H., 3d SAJC DC McKay S., Gr.3, MVRC Silver Thomas Hanley H.
FIRENZA (Kenny's Best Pal). Winner at 2, SAJC Walter Brown S.H., L, 4th SAJC Oaklands P., L. Producer. HI WORLD (High Chaparral). 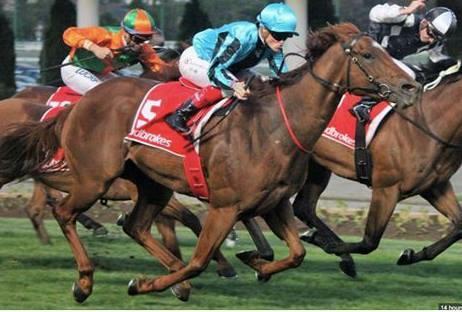 4 wins from 1400m to 2000m, A$291,825, in 2014-15, ATC Carbine Club S., Gr.3, Frank Packer P., Gr.3, Tab.com.au H., 2d VRC Saintly H., 3d VRC Carbine Club 2YO P., 4th VRC Carbine Club S., Gr.3. LOVEYAMADLY (Bel Esprit). 6 wins to 1200m, A$319,338, MVRC Adapt Australia Abell S., L, VRC Mrs Mac's Beef Pie Sprint P., 2d MRC Geoffrey Bellmaine S., Gr.3, Doveton S., L.
GOOD SIGHT (Lonhro). 6 wins from 1400m to 2000m, A$19,500, 1,210,220Rgt. in Malaysia, Selangor TC Piala Emas Sultan Selangor, L, 2d Penang Sprint Trophy, L, Selangor Gold Cup, L, Penang TC Yang di Pertua Negeri Gold Cup, L.
SAINTHOOD (Lonhro). 4 wins from 1300m to 2000m, A$319,605, Canberra RC National Sprint H., L, Murrumbidgee TC Wagga Gold Cup, L, 2d ATC Hall Mark S., L, Starlight H., L.
Illusionist (Favorite Trick). 6 wins to 1200m, A$164,900, MRC May H., MVRC Sunshine Coach P., Melbourne Hunt Club H., 3d MRC Sir John Monash S., L. Producer.